A modern look which highlights the beauty of a repetitive shapes from the Possini Euro Design lighting collection. Perfectly easy to use, this plug-in light features an on/off switch on the backplate. Installs easily, plugging into any standard wall outlet. Brushed nickel finish. Matte black finish backplate. White cotton and polyester blend fabric. Cord cover not included and is sold separately. 13" high x 12" wide. Extends 7 1/2" from the wall. Cotton-poly blend fabric shade is 12" wide x 6" high. Backplate is 5" wide x 3 1/2" high. Cord cover not included. 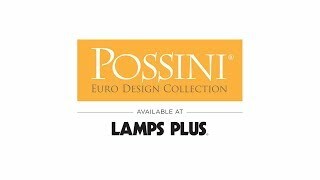 Modern plug-in wall lamp from the Possini Euro Design® lighting collection. Brushed nickel finish rectangular accent, matte black finish backplate.